Thank you to Durham First In Families for sharing this story. Donna is one of many individuals served by LUEWWD XI’s beneficiary organization. Please consider making a donation by voting for your favorite arm wrestler online or at the September 20th event. We’d love to see you there! Sign up to volunteer if you can! Donna, a self-advocate who uses a wheelchair and has a service dog, was in need of a ramp to allow her to enter and exit her home. She also needed a fence for her backyard so her service dog could go outside safely and not run in the street. Durham FIF partnered with Dickerson Fencing who built Donna a fence, and the Knights of Columbus who built a ramp. 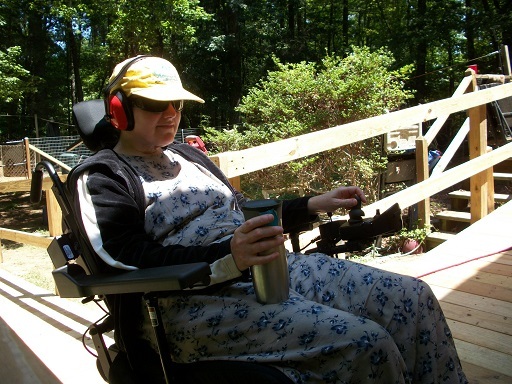 Now, Donna has peace of mind – she can access her home and her beloved service dog can play in her yard.